Blue Q, Wildkin, Eco Bags: Messenger Bag, Shopper Bag, Tote Bag! Jumpstart Messenger Bag: Wildkin's Jumpstart Messenger Bag is a cool, convenient messenger bag that keeps you organized and easily holds your 15 inch laptop, tablet, or books. Designed with 2 exterior front pockets, 2 utility pockets for phones, pens or paperbacks, and multiple interior pockets with a water-resistant lining. Two buckle straps plus Velcro-like closure for added security and an adjustable padded shoulder strap. Great for school, travel, afternoons at the coffee shop or for around town. Ages 8 +. Measures 10 H X 15 W X 5 D inches. 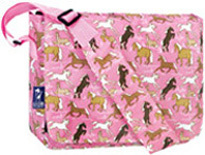 • Jumpstart Messenger Bag Horses in Pink: Horses in Pink features a group of whimsically wild horses that prance, dance, jump, and just chill; their brilliant white manes and tails absolutely shine atop the pattern's lovely, timeless pink backdrop. A bestselling Wildkin Classic. Ages 8+. Great gift idea! BUY NOW! • Jumpstart Messenger Bag Big Dot Aqua: Big Dot Aqua pattern displays trendy symmetrical, exhilarating aqua dots on a background of stunning purple. Ages 8+. Great gift idea! BUY NOW! 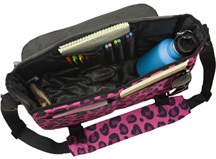 • Jumpstart Messenger Bag Pink Leopard: This Leopard pattern is hot - hot pink! We do not know how the Pink Leopard would fair in the jungle, but on the bags it is prominent. Ages 8+. Great gift idea! BUY NOW! 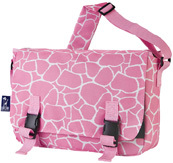 • Jumpstart Messenger Bag Pink Giraffe: Cloak yourself in the spots of the Pink Giraffe! Pink spots on a white background. Ages 8+. Great gift idea! BUY NOW! 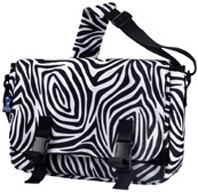 • Jumpstart Messenger Bag Zebra: This Zebra print may be a camouflage in the wild but will stand out in a crowd! The distinct anim al print is a swirl of black with white stripes. Ages 8+. Great gift idea! BUY NOW! Kickstart Messenger Bag: Kickstart Messenger Bag is multi-functional bag that is durably constructed featuring 6 Exterior front pockets, 6 utility pockets for phones, pens or paperbacks. Adjustable padded shoulder strap with Velcro-like closure. Great for school, afternoons at the coffee shop, weekend daytrips, and school. Ages 8 +. Measures 10 H X 13 W X 4 D inches. • Kickstart Messenger Bag Pinwheel: Pinwheel pattern is cheerful presenting bright colors and geometric shapes, this print will be sure to whirl you away to a celebration of color! Ages 8+. Great gift idea! BUY NOW! • Kickstart Messenger Bag Horses in Pink: Horses in Pink features a group of whimsically wild horses that prance, dance, jump, and just chill; their brilliant white manes and tails absolutely shine atop the pattern's lovely, timeless pink backdrop. A bestselling Wildkin Classic. Ages 8+. Great gift idea! BUY NOW! • Kickstart Messenger Bag Watercolor Ponies: In this creative horse pattern, the Watercolor Ponies are galloping, prancing and walking amongst paisleys and flowers. Ages 8+. Great gift idea! BUY NOW! • Kickstart Messenger Bag Big Dot Aqua: The Big Dots Aqua pattern displays stylishly-symmetrical, electrifying aqua dots on a background of rich purple. Ages 8+. Great gift idea! BUY NOW! • Kickstart Messenger Bag Owls: The fantasy owls are a hoot! Set on a pink wood-grain background, these colorful owls stand out from the rest. Ages 8+. Great gift idea! BUY NOW! • Kickstart Messenger Bag Peace Signs Purple: The timeless, colorful Peace Signs are set on a purple background. Ages 8+. Great gift idea! BUY NOW! • Kickstart Messenger Bag Pink Leopard: Robe yourself in the spots of the Pink Giraffe! Attention-grabbing Pink spots on a white background. Ages 8+. Great gift idea! BUY NOW! Laptop Messenger Bag: Multi-functional and multi-tasking - upgrade your look with our Laptop Messenger Bag. Protects your computer like an external firewall. Padded, secure, and loaded with pockets. Features padded laptop compartment, 2 Exterior front pockets, 2 inner utility pockets with pen holder, and a small zippered inner pocket. Adjustable padded shoulder strap with Velcro-like closure. Fits up to a 17 inch Laptop. Measures 18 H X 12 W X 4½ D inches. • Laptop Messenger Bag Pink Leopard: This Leopard pattern is hot - hot pink! We do not know how the Pink Leopard would fair in the jungle, but on the bags it is prominent. Great gift idea! BUY NOW! • Laptop Messenger Bag Twizzler: Get mesmerized in a symphony of hot pink and turquoise! Twizzler print is both stylish and full of fun! Great gift idea! BUY NOW! 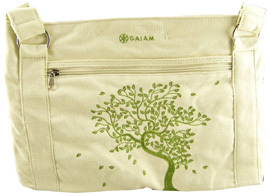 • Tote Bag Tree of Life: Gaiam's Tree of Life Tote Bag is crafted with 100% cotton and is fully lined with nylon fabric. Fits any standard or premium yoga or Pilates mat up to 28" wide. This spacious mat bag comes with full lining in nylon fabric, magnetic snaps, a zippered outside pocket and an inside pocket. Embroidered in gorgeous detail with the Tree of Life - a multi-branched tree that shows the idea of interconnectedness of all living things on the planet. 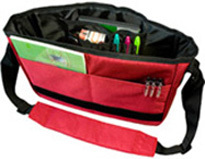 Measures 30 L X 6 D X 11 H inches with 33 inches long Shoulder straps. Great gift idea! BUY NOW!